The Law Association of Zambia (LAZ) has resolved to take the Zambian government to court for continuing usage of a colonial law to deny citizens the right of assembly. LAZ also has decided to seek court guidance on who should act as president when the substantive office holder is not in the country. LAZ president James Banda says his association will shortly file papers in the High Court to challenge the Constitutionality of the Public Order Act. The USA and UK government this week also expressed concern at the PF regime’s use of the archaic law to deny Zambians to assemble as they wish. President Michael Sata a few ago told the country that he now loves th Public Order Act because when he was in the opposition, he condemned it because he didn’t understand. But LAZ president James Banda says lawyers in Zambia are worried are concerned and worried that Sata and his ministers are endorsing this archaic law. 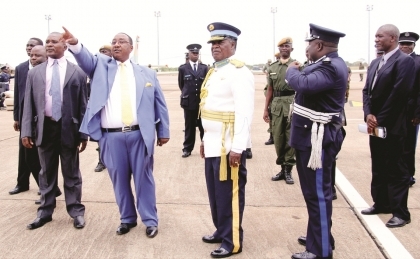 ‘Contrary to what is expected of a responsible leadership, our leaders seem to be praising and even rewarding Police officers who are brazenly infringing the Constitutional rights of the Citizens of Zambia,’ Banda said in a press statement. He said the ‘continued unreasonableness exhibited by the Government through the Police to prevent citizens of this Country from holding public gatherings is a source of great concern. ‘In the recent past we have reminded all stakeholders in the governance of our Country, including and particularly, the Executive that the right to freedom of assembly and freedom of association are inalienable and sacrosanct and that the same are guaranteed in the Bill of Rights as by the Constitution established. ‘On this basis, no person or government authority has the right to violate these constitutional rights of citizens, unless under compelling and clearly deserving circumstances. He said It is clear to lawyers in Zambia that the Public Order Act as it stands today is subject to manipulation and has been arbitrarily used to stifle freedom of assembly. ‘Accordingly our considered view is that such a law cannot be allowed to grace our statute books’, said Banda. ‘In this regard, we have decided to challenge the Constitutionality of the Public Order Act or some provisions therein in the High Court. Our litigation team will shortly file in the High Court an appropriate application to challenge this colonial law. The Association is also considering litigating on issue such as the Right of Citizens to have a lawyer present at whatever stage of investigations, the issue of who can be Acting president if the President is out if the Country and the legality of Statutory Instrument No. 33 of 2012’.